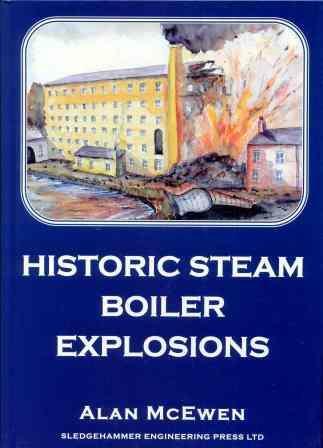 Alan McEwen's latest book records over 30 terrifying and horrific boiler explosions occuring in 19th and early 20th century Cotton Mills, Collieries, Ironworks, Bleachworks and several other Industries. This well researched book, the only one of its kind published in Great Britain for many decades also features the histories of early factory boilers: Balloon, Waggon, Egg-Ended, Cornish, Rastrick Vertical, Lancashire and other interesting early designs. The author has also included boiler explosions involving Traction Engines, Railway Locomotives and the disastrous explosion that claimed the lives of 45 men on board H.M.S. Thunderer. This beautifully produced book is profusely illustrated with over 170 black and white photographs and Victorian engravings, many being exceptionally rare that form part of Alan McEwen's Industrial Heritage Collection. This quality A4 size, hard-back volume complements his earlier title "Fred Dibnah's Chimney Drops".